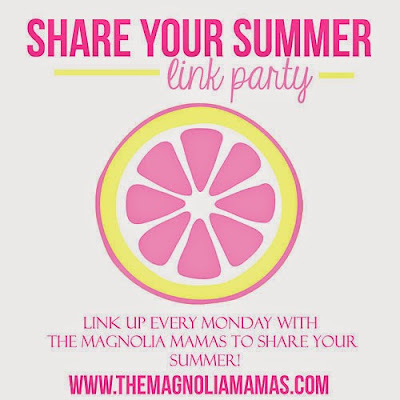 Magnolia Mamas : Share Your Summer: Summer Kick Off! Today we are so excited to begin our "Share Your Summer" link up series, and show you how we kicked off the unofficial/official start to summer. Memorial Day marks the unofficial start of the summer. Thursday marked the last day of school and the official kick off to our summer. 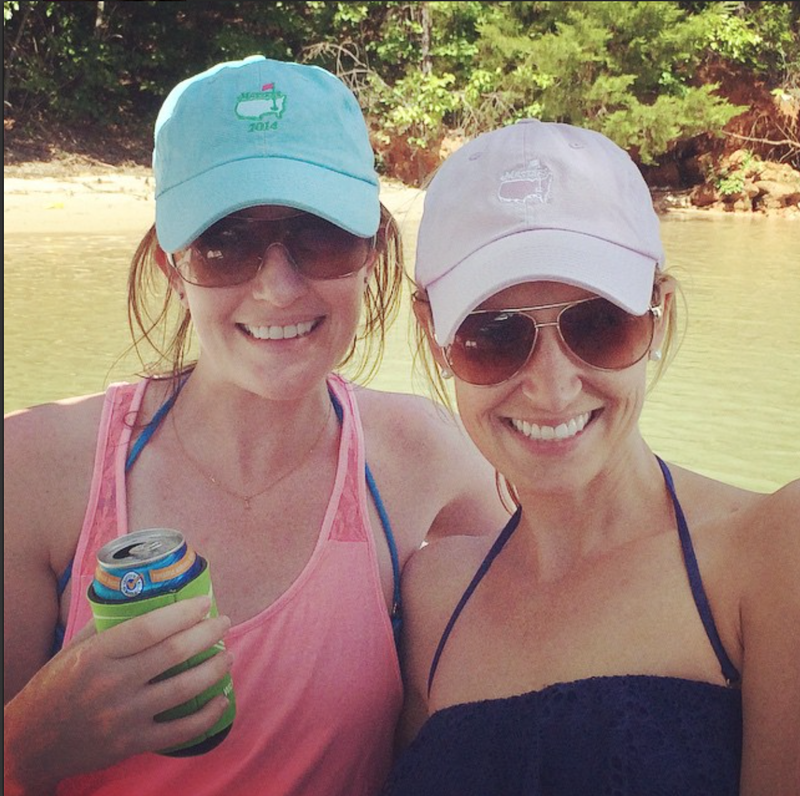 We celebrated with water balloons off the bus, bounce house fun with friends, and then grabbed some of our best friends to get the official party started at Lake Keowee in South Carolina. We look forward to this weekend the moment Christmas is over. 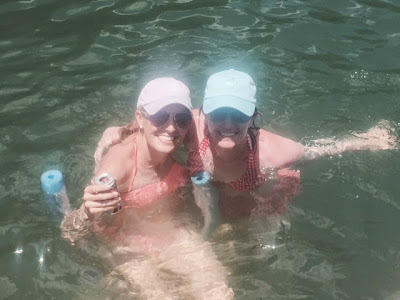 We are summer girls through and through and nothing makes us happier the spending our days enjoying the sunshine and a body of water. The moment we arrived at the lake house we threw on our swimsuits, packed our coolers, and made way to the boat. We didn't even bother unpacking our bags, we were so excited! 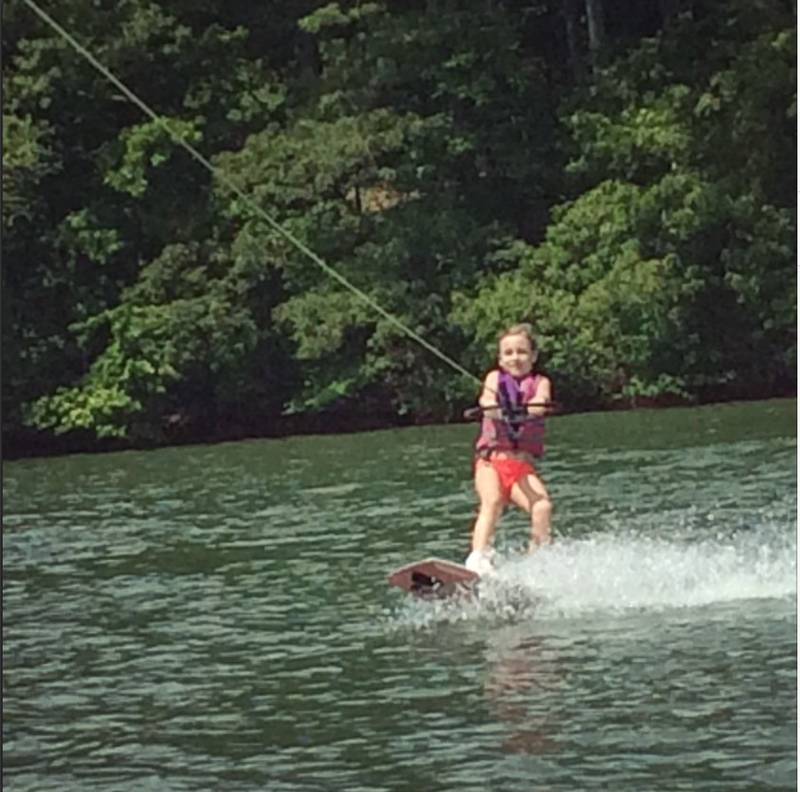 Our kids have inherited the love for all things summer, and by now are pros at lake life. Carrie Beth's children wasted no time breaking out their wakeboard and refreshing their skills. Little Mama showed us how its done! 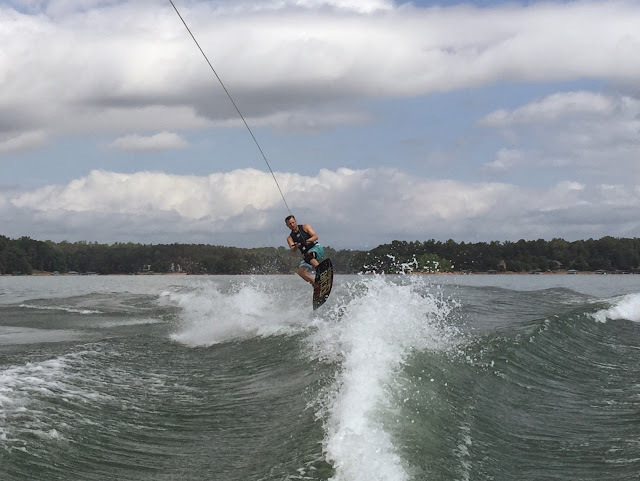 Boo-boo hasn't progressed to his own wakeboard yet, but he has skills of his own! Once everyone was well rested, we made our way back to the house for a quick change, only to head back out on the boat to one of our favorite local lakeside restaurants, Lighthouse. Not only does it have yummy food, and a tasty cocktail or two on the menu, it also has a huge grassy lakeside field that is perfect for the kids to play in. We love sitting on the deck and letting the kids just have fun. The played tag, read stories, and did cartwheels to their little hearts content, while the adults enjoyed a relaxing dinner of adult conversation. It is blissful. On the way home the kids begged to jump in the lake with their clothes on. A tradition Carrie Beth's family started years ago. It was freezing out, but that didn't deter them. And even more fun, Carrie Beth surprised them and cannon-balled herself in right along side them! Once everyone was done with their summer polar bear swim, we headed back to the house for the night. Everyone got warm and snuggly in their pjs and the boys insisted on having a sleepover like everyone else. The entire weekend we had only one little hiccup with the arrangements. Halfway through the first night both boys woke up and wandered around trying to find us. We realized in the morning the air mattress they were sleeping on deflated and it must have woken them up. Cute finally settled back down early morning with a snuggle from Walker. 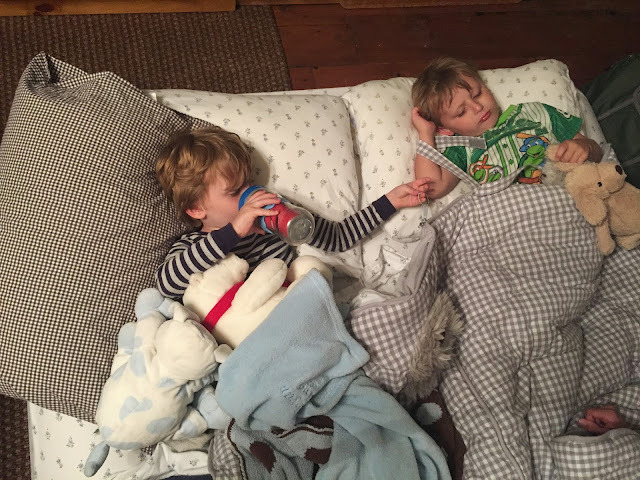 The boys later insisted on still sleeping together, and we were so happy to let them enjoy the arrangements. They completely surprised us and did so well! Not once from then on did they make a peep, and slept the entire night. We see lots more sleepovers in our future! The rest of Saturday we spent doing much of the same. 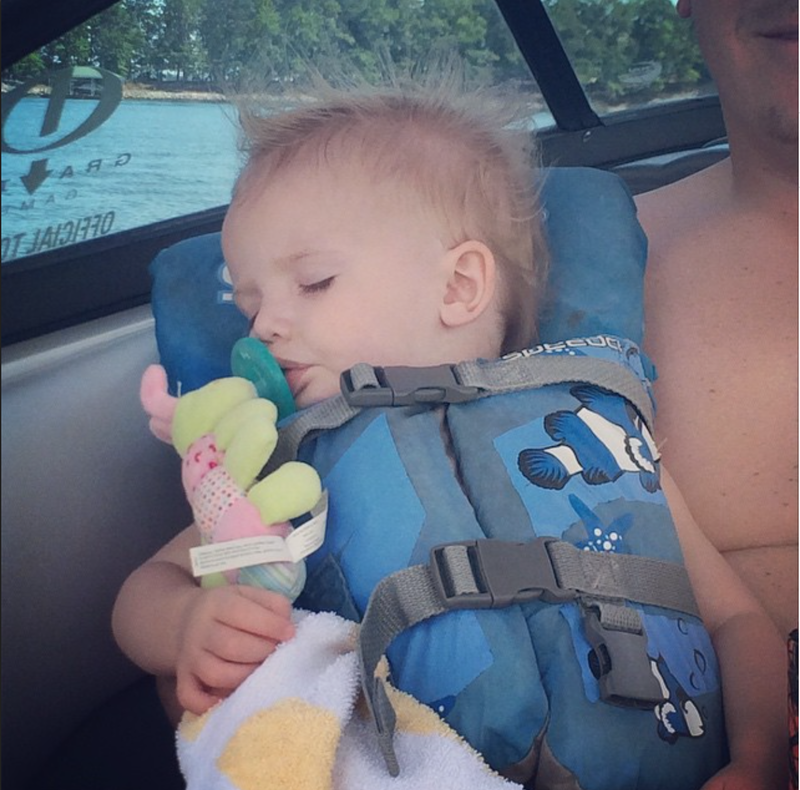 We packed everyone up for the a fun day on the boat and water, and we didn't hear one complaint from anyone. Especially once popsicles were involved. The kids wanted to change things up a bit, so we broke out the tube. They could have stayed on it for hours if we let them. It is huge and can fit most of them at one time. They think they are hot stuff showing off their "tricks" as we toot along. To wrap up our day we enjoyed a fun cookout, and Mr. Cute provided a little dockside fishing entertainment for some of the littles. On Sunday we made way for a fun little spot dubbed "the waterfall" because, well, waterfalls. This is an interesting place because the waterfalls lead up to a beach. People all hook up their boats in the cove and then swim in to play games, climb the falls, and maybe enjoy a fruity cocktail or two. We are not going to lie - it is highly entertaining and excellent people watching. All walks of life show up with one common goal - to have fun. Now we get there early when it is a little more family friendly, but post lunch things tend to get a little more college friendly and we make way for calmer waters. The kids have a blast, and always hate leaving. They throw rocks, play frisbee, swim, and try to see who can stand the freezing cold waters of the falls the longest. Memorial Day we kept up the routine and soaked up every second we could on the water. We knew we would have to head back home soon, and wanted to spend the day savoring this beautiful weekend as much as we could. The dads decided that it was enough with child's play, and showed the kids where they inherited their mad skills from. Daddy P has tons of tricks up his sleeve. Once everyone was nice and water logged, we made our way to a sandy beach for some playtime before enjoying a dockside pizza party. We are so excited summer is finally here!!! We couldn't think of a better way to kick it off and can't wait to spend the rest of the summer with you! So tell us, how did you kick off your summer? Be sure to grab the badge and Share Your Summer! Looks like the best time ever!!! Sand and Water - can't beat that combo! Perpetual summer sounds heavenly! We love seasons but summer is by far our favorite! Wait, do you have a dog named Walker? Our first baby was a mini schnauzer named Walker!